Increasingly I am beginning to develop a heartfelt hatred for systems that give a coach/manager of sporting team ultimate control over the team's destiny. The Ancient Greeks really were onto something when they dreamed up the system we now call democracy. Power to the people, I say. At the very least, power to more than one person. England will lose The Ashes. Why you ask? Two words: Duncan Fletcher. Fletcher is oft credited for the resurgence of English cricket. He formed great partnerships with Nasser Hussein at first, then Michael Vaughan (unfortunately, his latest partnerships with Strauss and Flintoff haven't paid off quite as richly). He was responsible for fostering an attitude where all individuals play for each other, for the collective. He taught the Poms how to be absolutely ruthless and clinical when the opposition was down (epitomised by the cold response to Ricky Ponting's flowing wound during the last series). For all the good he did, somewhere along the line, he grew comfortable in his surroundings. Fletcher started giving the impression that he knew exactly what to do to make his side win a match. Part of his strategy revolved around sticking, through hell or high water, with a core set of players. Cricketers that had been through the tough times and proven themselves to be good "team-men". This strategy will pay rich dividends if the players in the core group are at the top of their class, on a global scale - ala Warne, Flintoff, Ponting, Tendulkar, Dravid etc. However, such a plan is quite likely to go to the dogs in the event that injury , ill-fortune or bad form strikes one or a number of players simultaneously or within short time spans - as has been the case with England. While they were fit and on top of their game the likes of Flintoff, Pietersen, Jones and Vaughan (to an extent) were able to carry the lesser lights in the team. 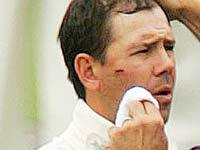 Geraint Jones' dropped catches were easily forgotten because the bowlers continued to manufacture other opportunities. Ashley Giles got the odd wicket (a wicket every 90+ balls for a specialist bowler is abysmal) because the opposition batsmen targeted him for cheap runs. In recent times, we have seen how the Poms have unraveled when their stars have not been around or have not been able to consistently produce the goods. Ian Bell has improved a shade to prop up the batting on occasion. Matthew Hoggard has provided some an avenue of attack when conditions have been favourable, but the bowling has looked toothless with the Steve Harmison MIA and Flintoff's body creaking under the enormous workload. The bench is almost talent-less and this has not helped the cause. However, the two players that have made a discernible difference have been Chris Read and Monty Panesar. Gone were the days of an inept 'keeper fumbling dollies and a spin bowler who couldn't spin it in dust-bowls. Read provided a calm assurance and Panesar provided an attacking option that has been the basis of recent English victories, particularly against Pakistan. For all of G Jones' batting prowess, Read has performed just as well and for all of Monty's much maligned frailties with the bat and in the field, he has redeemed himself (and then some) in terms of wickets taken. With all that success having gone to his head, Fletcher seems to believe the only way to beat the Aussies, again, is to employ the same personnel. If that were the case, Sourav Ganguly would still be playing and carting Australian bowlers all over the GABBA like he did in the first test of the 03/04 series. For some totally unfathomable reason, Fletcher has no faith in Read and Monty Panesar. This lack of faith has not been shared by either Flintoff, or Strauss, while they have taken turns at the captaincy. However, for some inexplicable reason, in the first warm-up match against the Australian PM's XI, Monty bowled 3 overs for not many while Giles got carted for 50+ in his 8 overs. Maybe that was an attempt to get some miles in Giles' legs. But, why? Wouldn't England be better off giving Panesar more match practice in Australian conditions? What is worse is that Jones was back in place of Read. If the Poms are serious about winning The Ashes, this is not the time to play favourites. Flintoff needs to get in Fletcher's ears and tell him, in unequivocal terms, that Panesar and Read are more likely to succeed than Giles and Jones. Plan and simple. As it is, with all their form and injury worries the English are going to have a tough time defending the urn. Fletcher's pre-occupation with recreating the past will definitely lose England The Ashes. It is time that Flintoff flexed his proverbial muscles and played a part in the selection of the team. Dictatorships have never been prosperous for all involved. Fletcher's version will not be prosperous for England, if it is not replaced by a democracy involving Flintoff - at the very least. it will be a travesty if Giles lines up ahead of panesar in the first test. infact IMO Giles shouldnt even get a game as long as monty is fit. i think fletcher is reaching the end of his shelf life. as successful as he has been in tests, hes been equally dismal in the ODIs. but then all will be forgotten if england manage to retain the Ashes!! To be frank, England won the ashes last time with a fluke, pleasent though it maybe. One has to keep changing strategies and players as change is the only constant in life. @ Ravi: It seems everyone except Fletcher seems to realise that Monty is 20 times the bowler that Giles will ever be. @ Hiren: I am not sure it was a fluke, but luck had a part to play, just like it has in Australia's dominance of world cricket over the last 15 years. As they say, you make your own luck.